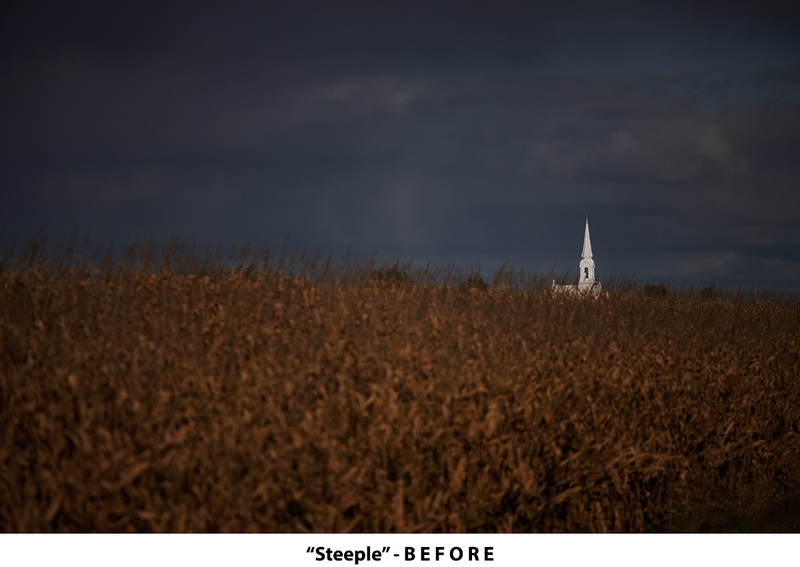 It's a fall day in rural eastern Ontario and a stark white church steeple seems to rise dreamlike out of a cornfield . The scene reminded me of the poet Matthew Arnold's "dreaming spires" in Oxford, England. I split the image into two parts - 1) the church; 2) everything else - and worked on them separately. In the "everything else" part, exposure correction was the first order of business. I had set the camera to an exposure preserving highlight details in the church but underexposing the rest of the image, so I fixed this. I shot with a long lens (200mm) wide open (f/4) which resulted in significant vignetting (darkening around the edges of the frame). But instead of correcting for this (which I would normally do) I chose in this case to enhance the vignetting to add to the dreamy mood I wanted to create. The foreground and background were already blurred from the lens being wide open, and I softened the focus even more with fine-contrast adjustments. 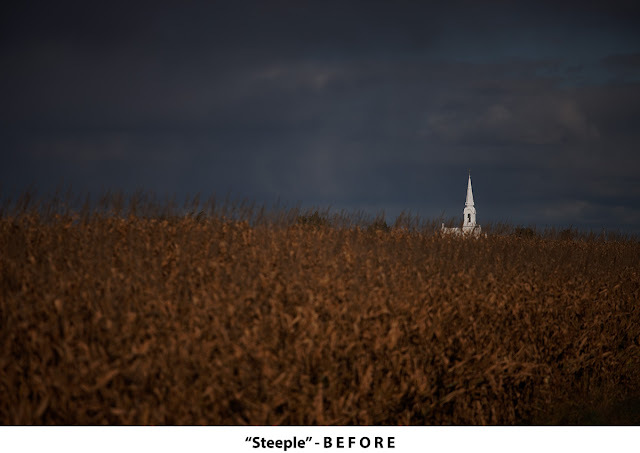 I added contrast to the cornfield and sky with tone curve adjustments. I reduced the color cast in the sky by partly desaturating the blue and cyan tones. As for the "church" part of the image, all I had to do was brighten it slightly. In trying to avoid washing out highlight details when taking the photo I had been too careful and so even the church was underexposed. I then combined the two parts of the image into one, being careful to blend the church seamlessly into the rest of the frame. 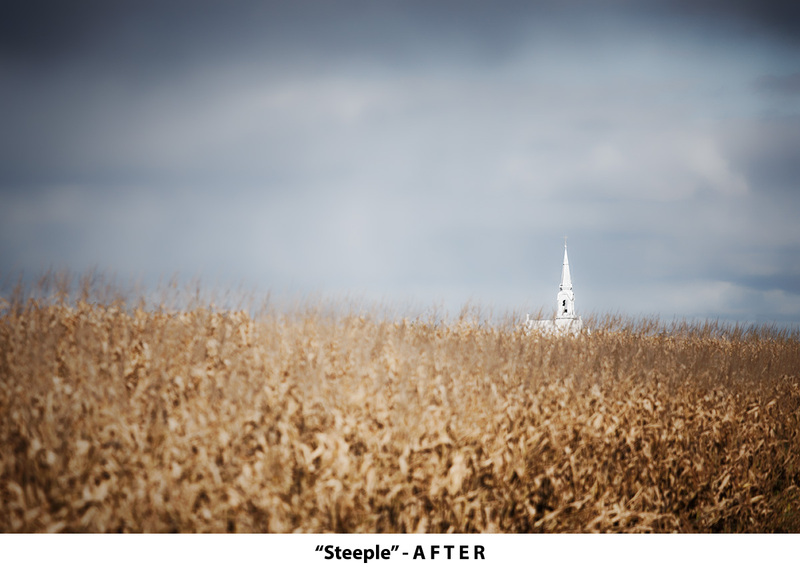 I cropped from the bottom to change the cornfield- to-sky ratio and bring the church a little closer to the center.